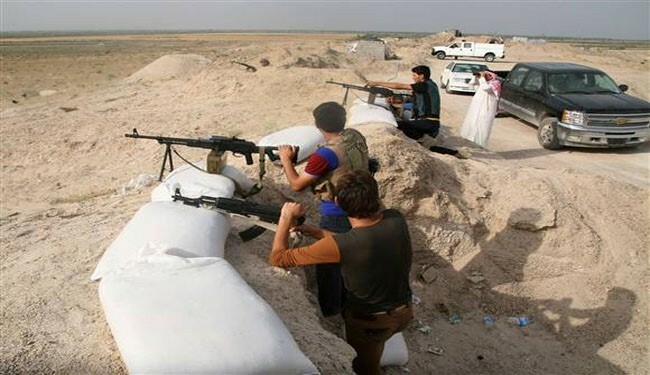 JNN 04 Aug 2014 Baghdad : Kurdish troops have reportedly fought off an attack by ISIL Takfiri terrorist on an oil facility and a dam near the Iraqi city of Mosul but lost 14 of their forces in intense combat. The Takfiri terrorists who still control the northern Iraqi city, “attacked a peshmerga post in Zumar (on Friday) and a fierce battle erupted,” Kurdish sources affiliated with the Patriotic Union of Kurdistan (PUK) were quoted as saying Saturday in an AFP report. They said 14 peshmerga fighters were killed, a toll confirmed by a senior officer in the Kurdish force. The PUK official said the peshmerga killed “around 100″ ISIL Terrorists and captured 38 in a battle that lasted several hours. Zumar is a small Kurdish-majority outpost northwest of Mosul, which used to be under federal government control but was taken over by the peshmerga in June. In Iraq’s eastern province of Diyala, Wahabi terrorist groups, including IS, took control of the southern part of the city of Jalawlaa, some 130 km northeast of Baghdad, after fierce clashes broke out at dawn with Kurdish security forces, known as Peshmerga, a provincial police source told Xinhua on condition of anonymity. The ethnically mixed city of Jalawlaa is part of disputed areas between the Arabs and Kurds, who want to annex it to their semi- autonomous region of Kurdistan. The Kurds’ claims about the areas are rejected by Baghdad government. ISIL terrorists, who had already been running large swathes of neighboring Syria, launched a blistering offensive on June 9 that saw them capture Mosul, Iraq’s second largest city, and a number of other towns in central Iraq. The security situation began to drastically deteriorate in Iraq on June 10 when bloody clashes broke out between the Iraqi security forces and hundreds of Wahabi Terrorists who took control of country’s northern city of Mosul and later seized swathes of territories after the Iraqi security forces abandoned their posts in Nineveh and other predominantly Sunni Majority provinces. Many Iraqi government forces retreated in the face of the foreign-backed onslaught, and peshmerga troops seized the opportunity to fill the vacuum and seize long-coveted areas the Kurds were in dispute with Baghdad over. This is while the PUK forces is known to have engaged in a number of terrorist attacks against Iraq, Turkey and Iran and is reportedly allied with Iraq’s Kurdistan regional government. A total of 33 people were killed and 94 others wounded in separate clashes with Wahabi terrorists and bomb attacks across Iraq, security sources said on Saturday. In south of Baghdad, helicopter gunships carried out air strikes against positions of insurgent militants affiliated with the Islamic State (IS), an al-Qaida offshoot in Jurf al-Sakhar area which located in the northern part of Babil province, killing at least 15 Terrorists and wounded 40 others, along with destroying three vehicles carrying heavy machinegun, a provincial police source anonymously told Xinhua. Separately, an army force at dawn raided IS positions, in the town of Latifiyah, some 30 km south of Baghdad, killing five IS militants, including a Syrian Terrorist known as Abu Safiyah al- Suri, the source said. The sectarian mixed province of Babil has been part of latest Wahabi Terrorism against the Shiite-led government. The area in north of the provincial capital Hilla, about 100 km south of Baghdad, is known as the Triangle of Death. It is a cluster of Sunni towns scattered north of the province. Iraqi government have repeatedly declared that Saudi Arabia, Qatar are among the regional countries funding and supporting ISIL and other terrorist in the country. This entry was posted in Iraq News, Middle East and tagged Baghdad. Bookmark the permalink.